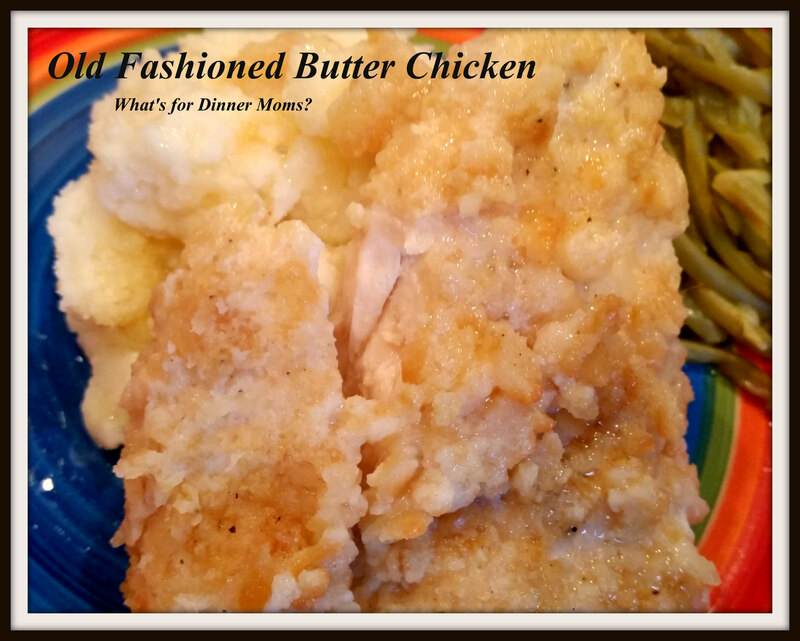 Old Fashioned Butter Chicken – What's for Dinner Moms? It was a crazy, busy weekend this week so there were no weekend posts like usual. I have only missed posting 6 days in the last 5 weeks. There was a Feis at the Michigan Irish Festival this weekend and on Sunday we went to see the National Touring Company of Wicked. Why have I waited so long to see this show? I love the music but I think it was because it was popular for so long and I tend to shy away from popular trends. Books, movies, television shows that become quickly popular are just not my thing. The only reason I ended up reading “The Hunger Games” was because I read it long before it became popular or I probably would not have read it. But, I am glad we finally went to see Wicked and my daughter loved it! So, dinners have been very, very simple lately. Some families have some dish that is sort of similar to this. Maybe it was made by your grandmother or mother. It can be made in a large cast iron skillet or a casserole dish but it has lots of buttery chicken (not to be mistaken for Indian Butter Chicken) which is a VERY different dish. My son made this for dinner last week and he was very proud of himself. It is a simple dish that you can customize with the spices in the cracker crumbs. Add garlic, Cayenne, chili powder, or onion powder the flavor is up to you! 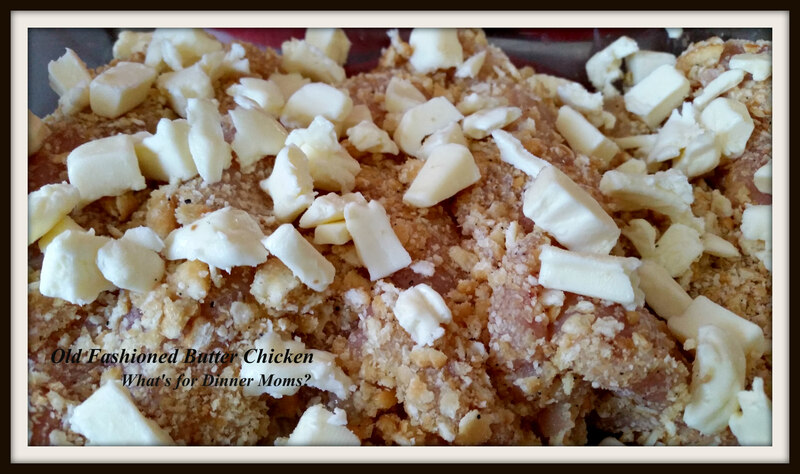 This chicken is super tender and flavorful. It is up to you to add spices as you wish to the cracker crumb coating. I used garlic, salt and pepper. That’s it. We LOVE garlic so I added a bit more than the recipe calls for to ramp it up a bit for our tastes. To make it gluten-free substitute gluten-free large grain bread crumbs for the cracker crumbs. I served the chicken over mashed potatoes with a side of green beans. The kids drizzled some of the butter/chicken mixture from the bottom of the pan over their potatoes to add flavor to them. The butter looks much worse than it really is in this picture. My chicken breasts were large so there was very little extra room in the pan. My son placed the butter mostly on top of the chicken and not around the sides of them too. Mix cracker crumbs, salt, pepper and garlic powder on a plate. Dip chicken breasts in egg allowing the excess to drip off back into the bowl. Then coat completely with the cracker crumb mixture. 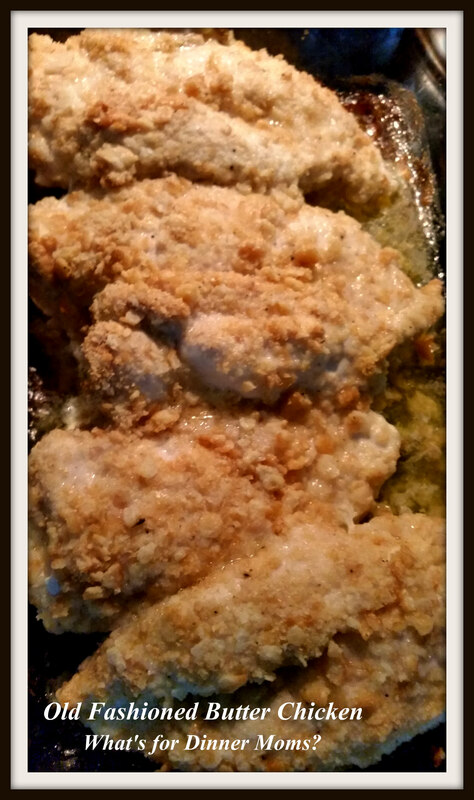 Lay chicken breasts in a casserole dish or cast iron skillet. Repeat until all breasts have been coated. Sprinkle the cold butter around and over the chicken pieces. Place pan in oven and bake for 25-30 minutes (this will depend on the thickness of your chicken breasts – they will take longer if not pounded down thinly) until fully cooked through. Remove pan from oven and serve with some of the butter drizzled over the chicken, if desired. I saw Wicked in May this year and loved it! I hope it comes back to San Francisco because I’d go see it again. This reminds me of the fried chicken my mom used make when I was a kid. It was yummy! Sounds Delicious! Have to try! Kudos to your son for cooking, yay! Looks yummy! Thank you. He is starting to enjoy it and asking lots of questions and has lots of suggestions. Can we…. If you have registered users you can give them permission to edit comments but most blogging sites don’t allow it. I am not too sure why. Hi ! Can I use Panko bread crumbs ? We have a lot of that in our pantry . Yes! It changes the taste and texture just a bit. Hope you like it! It is buttery! Very different that Indian butter chicken that’s for sure but this looks DELICIOUS! !